Multinational banks are preparing to pay out billions of dollars in fines to settle charges of foreign exchange manipulation. Some 19 investigations in ten different legal jurisdictions are now winding their way to completion and analysts says the final tally may hit $41 billion. These six banks number among a total of 15 that are being investigated for rigging the $5.3 trillion global market. Just four of the 15 together control over half the foreign-exchange market, according to Euromoney, an industry publication. Barclays of the UK has 10.2 percent of the market, Citigroup in the U.S. has 14.9 percent, Deutsche Bank from Germany has a 15.2 percent share while UBS of Switzerland has 10.1 percent. Members of the "Cartel" named in the lawsuit included Chris Ashton and Matt Gardiner of Barclays, Rohan Ramchandani of Citigroup, Richard Usher from JPMorgan and Niall O'Riordan of UBS, all of whom worked in London, where 40 percent of global foreign exchange trading takes place. To date UBS of Switzerland has had more employees suspended than any of the others. Seven traders have been suspended from UBS offices in London, New York, Singapore and Zurich. 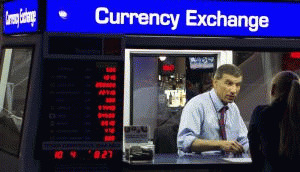 Experts say part of the problem is the lack of proper regulation of foreign exchange markets. "This is a market that is far more amenable to collusive practices than it is to competitive practices," Andre Spicer, a professor at the Cass Business School in London, told Bloomberg News. Recently the regulators have gone into overdrive. Some 19 different probes are being conducted by a slew of agencies from around the world including the Australian Securities & Investments Commission, the European Commission, Bafin in Germany, Hong Kong Monetary Authority, the Japan Financial Services Agency, the Commerce Commission in New Zealand, the Monetary Authority of Singapore, Finma in Switzerland, the Commodity Futures Trading Commission and the Department of Justice in the U.S.
Other banks followed suit this week. On Thursday, Barclays Bank of the UK announced that it was setting aside $780 million to pay the fines, followed by Citibank from the U.S. with $600 million. On Friday Royal Bank of Scotland announced a $640 million provision and HSBC of the UK is expected to announce it will set aside $640 million on Monday. The foreign exchange trading scandal has come on the heels of the global interest setting scandal for which a number of the very same banks have had to pay out a total of $5.8 billion in fines to date. CorpWatch: Non-profit investigative research and journalism to expose corporate malfeasance and to advocate for multinational corporate accountability and transparency. We work to foster global justice, independent media activism and democratic control over corporations. Our guiding vision is to promote human, environmental, social and worker rights at the local, national and global levels by making corporate practices more transparent and holding corporations accountable for their actions. As independent investigative researchers and journalists, we provide critical information to foster a more informed public and an effective democracy. We believe the actions, decisions, and policies undertaken and pursued by private corporations have very real impact on public life � from individuals to communities around the world. Yet few mechanisms currently exist to hold them accountable for those actions. As a result, it falls to the public sphere to protect the public interest. political process itself as they exert disproportional influence on public policy they deem detrimental to their narrow self-interests. In less developed nations, they usurp authority altogether, often purchasing government complicity for unfair practices at the expense of economic, environmental, human, labor and social rights. Yet despite the very public impact of their actions and decisions, corporations remain bound to be accountable solely to their own private financial considerations and the interests of their shareholders. They have little incentive, nor requirement, for public transparency regarding their decisions and practices, let alone concrete accountability for their ultimate impact.